The revival of immigration to the United States since 1970 has been accompanied by substantial social change. Immigration was initially focused in states such as California, Florida, and New York, but it spread across the country beginning in the 1990s. Many questions remain about the newcomers with such a rise in immigration and new immigrant destinations: Will they learn English? Are they locked in poverty? What are their prospects for success in America? 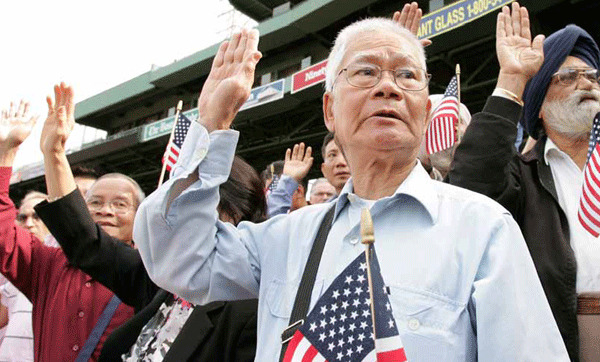 Most importantly, will today’s immigrants fully integrate to become tomorrow’s Americans? This report attempts to answer these questions. It examines the future outlook for the nation’s immigrants, projecting their gains from today through 2030. Policy options exist to diminish or enhance the integrative trajectories of immigrants. Nevertheless, our projections assume no change—either positive or negative—from the historical patterns of attainment or the historical policy environment. The report is the second part of a project on immigrant assimilation conducted by the University of Southern California in partnership with the Center for American Progress, with funding support from the MacArthur Foundation. In the first part, “Assimilation Today,” the authors described the process of immigrants’ assimilation as it unfolded over the last two decades. In that report we found that immigrants are following the path of their predecessors and assimilating just as rapidly today as they did in the past. In this report we carry that analysis forward to 2030 to see what immigrant integration will look like in the next few decades. In particular we focus on the cohort of immigrants who arrived in the 1990s—part of the largest wave of immigrants to come to the nation. We further break down the achievements for adult immigrants and their children, and between all immigrants and Hispanic immigrants. Most impressive is the fact that the percentage of immigrants who own rather than rent their homes is projected to rise from 25.5 percent in 2000 to 72 percent in 2030. Furthermore, the percent speaking English well or very well is projected to rise from 57.5 percent to 70.3 percent and the percent living in poverty is projected to fall from 22.8 percent to 13.4 percent. This is contrary to assertions of nativist scholars such as Samuel Huntington who argue that Hispanic immigrants are not assimilating by dint of their large numbers and proximity to their home country. Hispanic immigrants’ advancements mirror that of all immigrants, albeit from a lower starting point. Their anticipated increase in homeownership is particularly noteworthy, from 21 percent in 2000 to 67 percent in 2030. 3. Immigrant youth (age less than 20 on arrival, roughly 20 percent of all immigrants) also show positive gains and dramatic changes between generations. These changes illustrate just how much an early arrival helps in the integration process. High school attainment is greatest for immigrants who arrive the earliest. College completion travels along a similar trajectory. Fluent English language acquisition increases even more dramatically for children arriving before the age of 10 compared to teenagers or young adults. The Great Recession of the late 2000s set back immigrants. But we find that they are surprisingly resilient. Despite the downturn they still ended the decade better off than they were in 2000. These immigrant advances are substantial and entirely to the benefits of longer settlement and deepening roots in America. Yet such broad gains should not be taken for granted because past rates of immigrant advancement depended at least in part on economic growth and public investments in education and other supports—all of which are now threatened. We should pay attention to immigrants’ future achievement because we will greatly depend on their human resources in coming decades. The coming retirement of the large generation of baby boomers, for example, is expected to create urgent labor needs among private and public employers, and falling labor force growth opens many opportunities for new workers. Likewise, immigrants help shore up programs such as Social Security, and losing them would mean a significant shortfall. The housing market also depends increasingly on immigrant households, who disproportionately own their own homes. Without their buying power homeowners would find it harder to sell their properties. The coming decade is a pivotal period in the nation’s economic history and deserves to be closely monitored. The findings of this study demonstrate how rapidly the new immigrant residents are likely to advance. Their success will be a vitally important contribution to the new economy. What we as a nation do in the future—whether we pass an immigration reform package that allows all immigrants living in the shadows to become legal and become full and productive members of society or not—will have a great impact on our progress going forward. This report demonstrates the great potential of immigrant residents. Immigrants do not remain mired in their status as newcomers but surge ahead on many scores. Their progress has been extraordinary and it could become even greater but for the growing number of obstacles placed in the path of many immigrants. One of the main criteria that should be considered in debates over comprehensive immigration reform is how might we maximize the great potential of our new immigrant residents so that they can contribute even more to our nation. Dowell Myers, a demographer and urban planner, is a professor in the USC School of Policy, Planning, and Development where he is director of the Population Dynamics Research Group. John Pitkin, an economist and demographer, is a senior research associate in the Population Dynamics Research Group of the USC School of Policy, Planning, and Development.